…and this might not be news for many of you, as me and my fiance have been engaged for just over an year now, however we’ve been blissfully procrastinating the wedding planning up until now. To be honest, I have no idea how to plan a wedding. Obviously, as I have never planned one before! So I’ve started reading, creating Pinterest boards (duh?!) and I figured out I need to invite my bridesmaids properly (not just “Hey luv, ya gonna be my bridesmaid, yah?”). 98748659832759649357 Google searches later and 947256909 hours spent on amazon, etsy and ebay, I finally knew what I wanted for my girls! Let’s start with my little beautiful Flower Girl! Her name is Amelia-Rose (as you can see from the photo) and she is currently 9 months old. By the wedding she will be old enough to run around with an adorable fluffy tulle dress. For her invitation I chose a teddy bear with printed shirt, that comes in a pouch with printed personalised text. At her age, she was more fascinated by the wrapping, but I am pretty sure I can count that as a positive response to my invitation. Now, for the grown ups! I wanted to put together small packs for each one of them, so I spent a lot of time researching different options. I wanted to get things they will use and enjoy, which is why I opted for a more practical choice than the regular gift box. I ordered some beautiful white baskets with lid, which you can find here . They are quite universal, so the girls can use them for various things at home. I then ordered some purple (obviously) lace fabric roll , which I used for closing the boxes and creating a nice (hopefully!) ribbon on top. Sticking to the purple theme, let’s see what I chose for the inside – I am warning you – everything is going to be shades of purple and pink. At the bottom of the boxes I put just some shredded paper to keep the presents nice and safe. For each bridesmaid I ordered a printed tote bag, which seemed like a handy gift they can use on the wedding day to carry around important things like spare shoes, and can also utilise as shopping bags later. For all five bridesmaids and the Maid of Honour (I might do a separate post about her invitation) I ordered personalised champagne flutes to be made. My idea was to have a drink to celebrate the occasion when I’m inviting them and also to keep the glasses and use them on the wedding day for the photo shoot (Dear bridesmaids, if you are reading this, and you’d better be, may the odds be ever in your favour when it comes to preserving them until that moment. Love ya!). I must say I am very impressed with the company that I chose – SuperNova Bling. They were very quick with shipping my order and the quality of the glasses is lovely – hard to believe, but that glitter is well glued on and is not going anywhere! Champagne glasses are all cool, but you need to have something to drink from them! 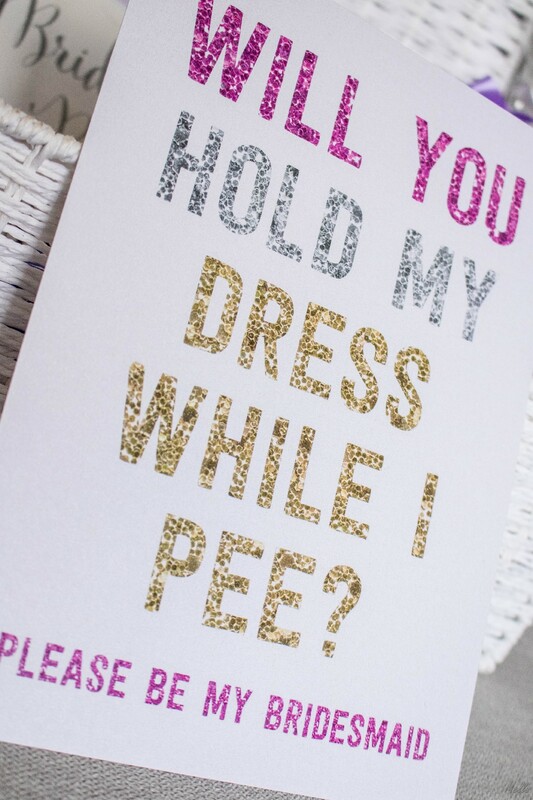 If you’d like to do the same for your bridesmaids, but you’re on a budget, I would say go for prosecco or sparkling wine. I just had a snobby moment and wanted to treat the bride tribe to some nice actual champagne. Now, is Moët & Chandon the best? I don’t know. But they were the only ones (along with Lanson, I think), that make mini bottles of rosé champagne. And they are extremely cute. Along with the rest, I found on eBay those adorable hair ties with “Team bride” printed on them and on the packaging it says “To have and to hold…your hair back…”, so how could I ignore them?! 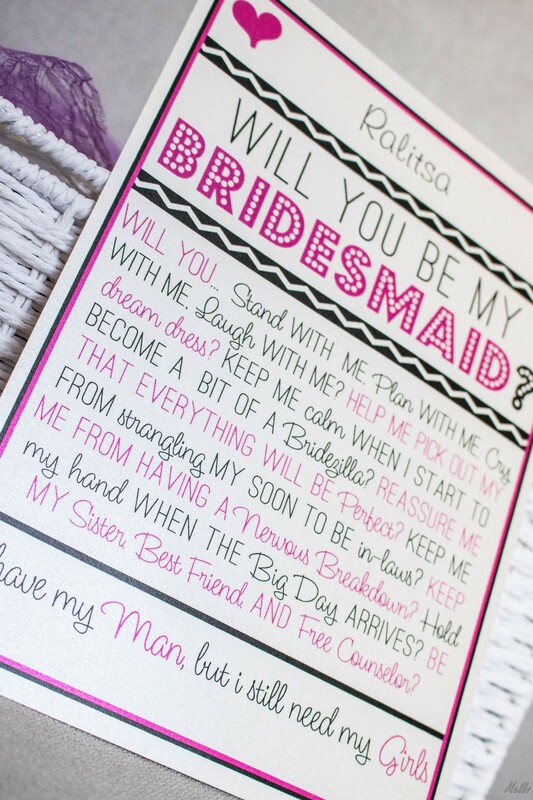 Getting to the fun part, I wanted the actual invitations to not be the typical boring “Will you be my bridesmaid?” when it comes to the text. It took a lot of searching, but finally I found a website with RIDICULOUSLY large selection of cards – Zazzle. I picked a different card for each one of the girls and these are some of them, so you can have an idea of what the website offers. The quality is absolutely amazing and the delivery was quite fast too. Now, after all my members from Team Bride have said “YES” to my proposal, it’s time to plan a wedding! Любимата ми покана е Ще ми държиш ли роклята, докато пишкам! 😂 Много й се радвах и аз на тази покана!